The first volume of GATE 7, released June 3rd (2 days before the end of this week’s ranking), scored a total of 93.210 copies sold, according to Oricon. Very good numbers. For comparison’s sake, the volumes of XXXHOLiC and Tsubasa sold around 190.000 copies in average on their debut weeks and the Kobato. volumes usually sell around 40.000 (or less) copies on their first week of sales. However, it’s worth mentioning that GATE 7 was released in the middle of the ranking week, therefore it had very good numbers for only 3 days of sales. Let’s wait for the next week numbers to have a clearer idea. Also, this week 2 new PVs of BLOOD-C were posted at the official website. In one of them you can listen to a preview of the OP theme song, performed by DUSTZ. I really like the first one =) Less than a month now before the TV series starts. Not sure how important this “news” is but I thought I should share it xD CLAMP member Nanase Ohkawa recently wrote in her Private Board that she’s been taking the other CLAMP members to her yoga classes. First she took Satsuki, then Nekoi and Mokona. Now all 4 CLAMP members are taking weekly yoga classes. You might all remember a while ago when Ohkawa mentioned her yoga teacher had a very healing voice and she wanted the anime version of Kobato to have the same healing voice as her. Hehe, my favourite seiyuu is on BLOOD-C. He posted the other day on his blog that the recordings for this series had started. So I’m giving this anime a try. 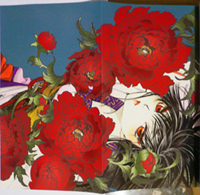 And thanks for the news about Clamp’s yoga, even if it’s trivial. I marathoned all 50 episodes of BLOOD+ on youtube last week, in order to get a feel for the Blood franchise. It was amazing. It was very, very “Shoujo” but with lots of violence and blood and plot (not that shoujo can’t have any of those, we all know what X was like . . .) and it had the same sorts of backstories and twists you might expect from an unusual author like CLAMP. I recomnend it. It’s very long, but it’s cut into 4 “seasons” so it’s much easier to watch than you might think. Last Blood isn’t a series. From the date they gave, I’m assuming they are referencing the live action movie. I adore Kobato, and frankly, I don’t think two chapters is enough, but yeah, if they resume an older series I am more than happy to offer it up as a sacrificial lamb. It seems to be the a live action remake of Blood: The Last Vampire, as you guessed. For Kobato, there may be an extra chapter in the tankoubon. Who knows what they might do inspired by their yoga classes xD CLAMP’s reality is always somehow reflected in their works. The two trailers are amazing! (for Blood-C) I’m curious to see how far this goes! LOL! Good that you are smart enough! Sorry for posting here so long after the fact, but having just recieved my Dark Horse edition of Volume 1 of Gate 7, I have to ask . . are all these gorgeous cover pictures in color in the Japanese version? There are so many beautiful color illustrations that are printed in black and white, it’s my only complaint, really. I was just wondering if it was worth my time to seek out the Japanese edition. Yes, they are all from the japanese version. No, my question was, were all of the originally color illustrations in volume 1 still in color in the japanese version.